UNC Kenan-Flagler Professor Deborah Stroman connects students and professionals to better the business of basketball. 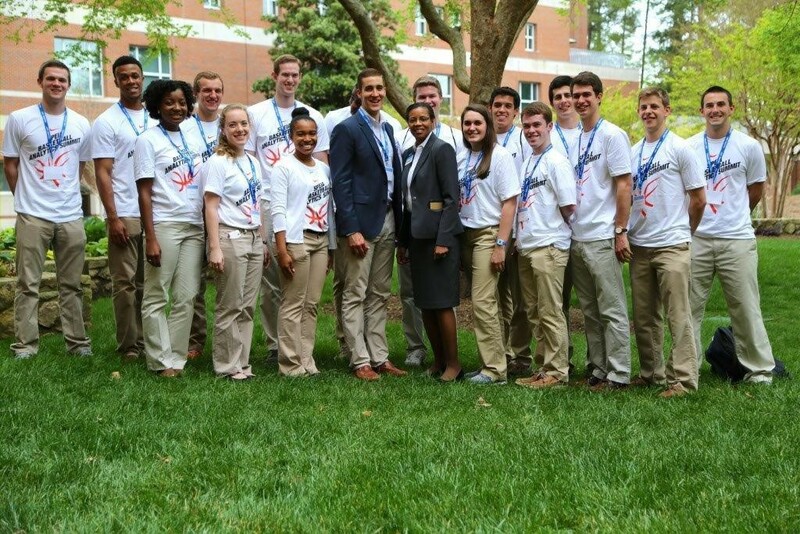 Deborah Stroman, a professor at the UNC Kenan-Flagler Business School, and Bryce Parrish, a second-year MBA student, stand front and center with the rest of the 2015 Basketball Analytics Summit team. Deborah Stroman knows how to build a business — especially in the world of sports. Before becoming a professor in the UNC Kenan-Flagler Business School, Stroman owned a sports marketing and golf event planning company, and worked in financial services for more than 17 years. Not getting caught up in the cliché, Stroman recognized the need to connect people in the world of basketball. This led her to her next big idea — the Basketball Analytics Summit. For the past two years, UNC has hosted the two-day conference, bringing together students, professionals, and scholars interested in basketball performance and business analytics. The third annual summit will take place on April 15 and 16 at UNC. Although she spent her undergraduate years at the University of Virginia and earned a PhD in business at Capella University, Stroman still cherishes her “blue blood” as she received her master’s degree in sport administration from UNC. “We build a brand here at Carolina. Not only do we play basketball well, but we do business around basketball well,” Stroman says. As the director of sport entrepreneurship and community engagement at the Frank Hawkins Kenan Institute of Private Enterprise, she separates her work into three buckets: analytics, impact, and connections. Analytics relate to the behind-the-scenes data involved in sports. For sports science enthusiasts, this can mean insight on how to make players faster and stronger. For marketing professionals, they provide a read on fan engagement, whether they are in the stadium or on their sofa. Intrigued by it all, Stroman believes that teaching students about the comprehensive nature of analytics is paramount. “It is a lot more than the Xs and the Os on the whiteboard, or how your team plays on a particular night,” she says. Impact measures the relevance of the sport to the state, and Stroman sees the importance in studying all different kinds — from the nationally recognized basketball program at UNC to the lesser known Triangle Table Tennis center in Morrisville. “North Carolina has a lot more than NASCAR and basketball,” Stroman says. The table tennis center, for example, is a National Center for Excellence visited and used by the Chinese National Team. Since its inception, Stroman has hosted representatives from basketball programs at the University of Kentucky and Duke University. Sports industry guests include the President of ESPN, the CEO of Automated Insights, NBA franchises, Google, and a brand manager at Coca-Cola. Each year, Stroman teams up with the Charlotte Hornets to create and judge a case competition where students compete for a cash prize and basketball signed by the team. Blue blood also runs in the veins of Bryce Parrish, who grew up a Tar Heel in Chesapeake, Virginia. His UNC alum parents decided to raise him as a Carolina fan because of the lack of local colleges or professional teams there. “It gave me an excuse to keep the Tar Heels first and foremost on my list,” Parrish says, “which makes it fitting that I am here now.” While searching for places to pursue his MBA, UNC Kenan-Flagler’s sports business program immediately interested him. Once accepted, Parrish made it his goal to become a Leadership Fellow within the Kenan Institute. The fellowship is incredibly competitive — and accepts only five to seven candidates out of the majority of the MBA student body — but he thought he had a shot. “I have always kind of been a basketball nerd,” he says. “And everyone on campus knows me as the sports guy.” So it was no surprise when Stroman asked the first-year MBA student to help organize the summit last year. Parrish came out of the conference with a new understanding of the field. “It opened my eyes to the different avenues of sports business,” he says. “I became more informed on how I could pursue those career paths.” The summit encouraged him to apply for a brand marketing internship at Coca-Cola last summer, which he scored. Stroman hopes the summit will continue to spark the interest of those like Parrish, but also business majors not as interested in sports. Deborah Stroman is the director of sport entrepreneurship and community engagement at the Frank Hawkins Kenan Institute of Private Enterprise and an adjunct associate professor of organizational behavior in the UNC Kenan-Flagler Business School. She also coordinates the College of Arts and Science’s Entrepreneurship minor (Sport Ventures) and serves as the faculty advisor to the Carolina Sport Business Club, MBA Sports and Entertainment Club, and Sigma Alpha Lambda.